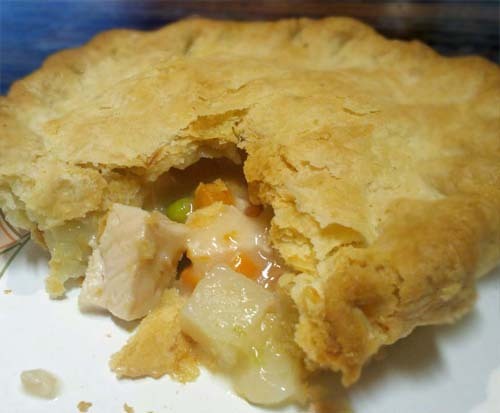 Here's a real simple recipe for a chicken pot pie with homemade gravy. The crusts are store-bought, but sometime in the future, I'd like to learn how to make my own crusts. But for now, off-the-shelf pie crusts are good enough. Cook the chicken breasts anyway you prefer. I tend to boil mine and cut them into cubes if they're not leftovers. Once chicken is ready, set them aside. In a covered saucepan, boil the veggies (peas, carrots, potato) for 15-20 minutes. Drain water, mix with chicken, then set aside. Make the gravy in a saucepan by cooking the onions in butter until transparent. Add flour and whisk away. Slowly add broth while continuing to whisk. Then finally, add milk while whisking. Add salt, pepper, and garlic powder to taste. When gravy is done, evenly distribute the veggie and chicken between the two pie crusts. Top both crusts with gravy then seal. Bake for 30 - 40 minutes until the crust is golden brown.